Dan is a modern day troubadour in the truest sense of the word. A full time musician, Dan travels the country with banjo, fiddle and guitar singing songs and telling stories while clogging to the rhythms of his Southern Appalachian roots. Dan is a Pittsburgh, Pennsylvania native who now makes his home with his wife Jennifer in Galia County in the Appalachian region of Southern Ohio. Dan’s parents were Pittsburgh, Pennsylvania natives as well and they raised him with the music he has come to perform. His father, Fred, called dances and his mother, Naomi, played piano, guitar, and sang in several musical groups in the Pittsburgh area. They even met at a square dance! He has been touring inter-nationally some 16 years now. In that time he has become a well known artist of the Appalachian style fiddle and old time clawhammer banjo. His stage show, An Evening with Dan Levenson, combines old time fiddle, Appalachian banjo, guitar, dance and song in a storytelling format to tell the story of life in rural Appalachia and life on the roads of America via the music of our country. He is an accomplished and dynamic fiddler who has taught himself to fiddle and clog at the same time–a real treat to see! Audience participation and occasional guest performers figure strongly in his shows and children won’t let themselves be left out of the fun! 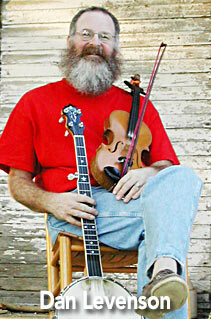 Dan is a native southern Appalachian style fiddler. A part of his show is telling the story of each of his fiddles and their respective tunings. Double stops, special effects, and exquisite bowing round out his style and make him an exciting visual as well as listening experience. In 2001, Dan went contesting a little in his home state of Ohio and won the Old Time Fiddle contest in Coshocton and took second place at the Caesar’s Creek Old Time Music Festival. He teaches pre-beginner to performance level fiddlers at workshops, festivals, and camps, and has students all across the country as well as around the world. Dan combines superb musicianship with the ability to teach what he knows in a way folks can understand and apply to their own playing. His fiddles were built by award-winning and living American fiddle builders, Clifford Hardesty of Coshocton, Ohio and Elon Howe of Newego, Michigan. Dan’s relationship with these fine gentlemen is also part of his story and both men continue to maintain Dan’s fiddles in top playing condition. Dan Levenson has been voted one of the country’s top ten clawhammer banjo players by Banjo Newsletter readers. He is well known as the banjo player for the Boiled Buzzard Stringband and now, the fiddler for The Hippie-billies – Dan and Miss Jennifer’s new band. Dan has traveled inside and outside the country playing and teaching for many years. He teaches the full range of levels from the outright beginner to performance level. He is the originator, owner and presenter of Meet the Banjo™, a 3 hour hands-on workshop where he brings the banjos! This class teaches history of the instrument and introduces both bluegrass and clawhammer styles. His beginner’s video/DVD series and class is entitled Clawhammer from Scratch: A Guide for the Clawless is the first new old time clawhammer banjo instruction manual in over 20 years and is a Mel Bay Publication as is his prior tab book Buzzard Banjo Clawhammer Style. Dan is an endorsee for the Deering Banjo Co., OME Banjos, Cedar Mountain Banjos and Lee Banjos as well as for Taylor Guitar, Elixir Strings, The Colorado Case Co. and the Stewart MacDonald Co. His tenth recording, Bare Naked Banjos, is a solo banjo album that has received exceptional revues from Bluegrass Unlimited and Sing Out! magazines as well as a great deal of interest and play time by traditional music radio stations in the United States and abroad. He even finds time to write for Banjo Newsletter, THE publication dedicated to the Five String Banjo.